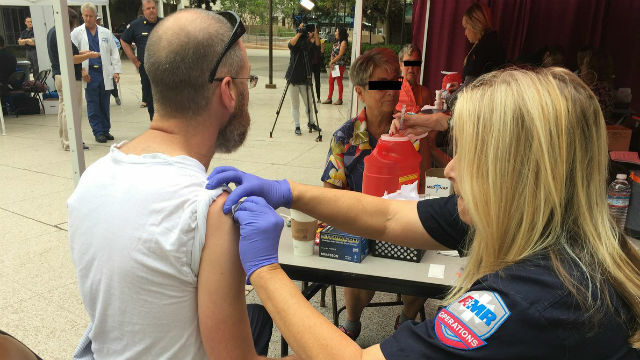 San Diego County could have reduced the risk of the spread of hepatitis A last year with better organization and hastened vaccination efforts, according to a report released Thursday by state Auditor Elaine Howle. According to the report, the county failed to set appropriate targets to vaccinate at-risk county residents and did not determine the level of resources such as nurses that would be needed to administer vaccinations. While an average of 20 new hepatitis A cases were confirmed each week from May to mid-September 2017, vaccinations increased significantly by only September. According to the auditor’s report, vaccinations in September and October totaled more than 41,000, compared to about 7,700 in August. The spike in vaccinations led to a decrease in new cases, suggesting that the county could have limited the outbreak earlier in the year. The city and county of San Diego also failed to improve sanitation conditions in a timely manner, failing to increase access to hand-sanitizing stations and public restrooms until September 2017. According to the audit, such dysfunction was due to the county’s failure to inform the city of San Diego how severe the outbreak became. Howle’s office suggested multiple recommendations to the city and county to improve their responses to public health outbreaks. 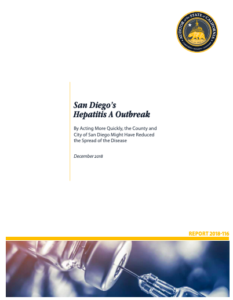 The auditor’s office advised the county to update its emergency operations plan by April 30, 2019, share relevant data with local jurisdictions and come to an agreement with the city of San Diego by March 31, 2019, to clarify how each entity should respond to future public health problems. Howle’s office also advised the city to examine its actions during the outbreak prior to the emergency declaration on Sept. 1, 2017. The city was also urged to fix any weaknesses found during the review.